I have said a number of times how things seem to be interconnected. You research an article and then that spins off to something else which doesn’t quite fit your niche on one site yet dovetails nicely with the article thread on another. In this case you write the article for the other site and put a short, sweet post on your main site as a directing beacon to light the way. As a Spiritual Warrior and Seeker of the Way, I am always intrigued by the way in which the universe continually draws me in a certain direction. No doubt my regular readers are wondering where I am going with this dialogue, well, it has to do with my last mini-post, “What have Ancient Aliens, The Mayan Calendar and 2012 got in Common?” which directed people to my sister site of Beyond 2012 HQ. 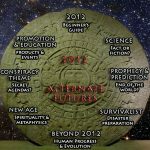 While researching the information for the article on “Ancient Aliens, The Mayan Calendar and 2012“, I stumbled across a video by David Wilcock talking about the “2012 Enigma: Blueprint for a Golden Age” in which he talks about the coming enlightenment of humankind. Watch it and listen to the words about the spiritual change that he sees approaching. Where do we find Enlightenment? Once you have watched and listened to this video, have a read of the articles and please leave a comment below.